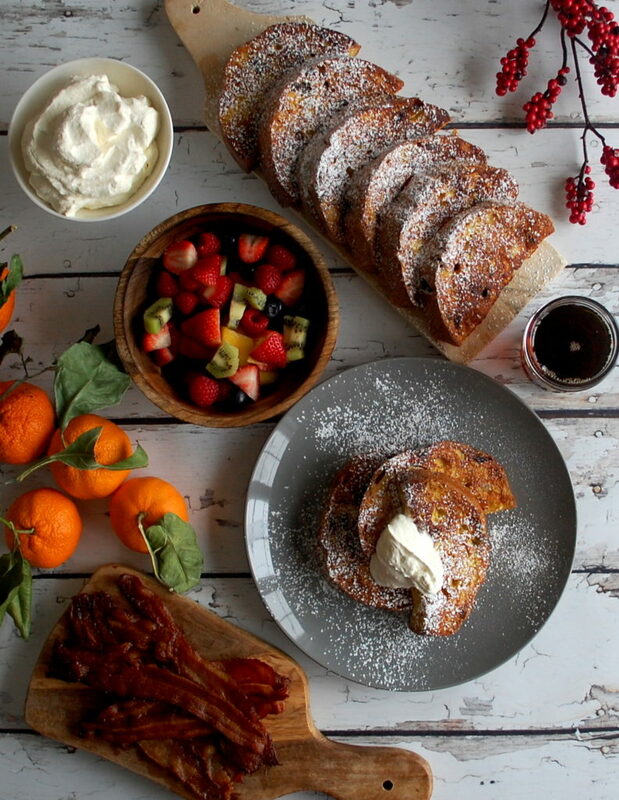 I think one of the best parts of the holiday season is breakfast. Breakfast is something that’s pretty routine for most people. Sometimes it’s rushed. Sometimes it’s a piece of fruit. Sometimes it gets skipped altogether. 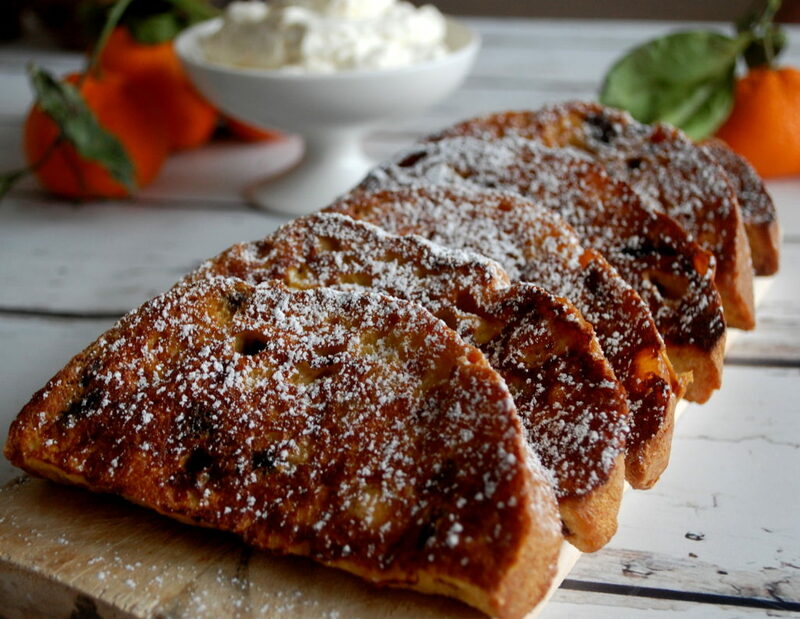 But special occasions like Christmas and New Years (and all those days in between the two) give us the best excuse to go all out for breakfast, and make something special like this panettone French toast with orange cream. 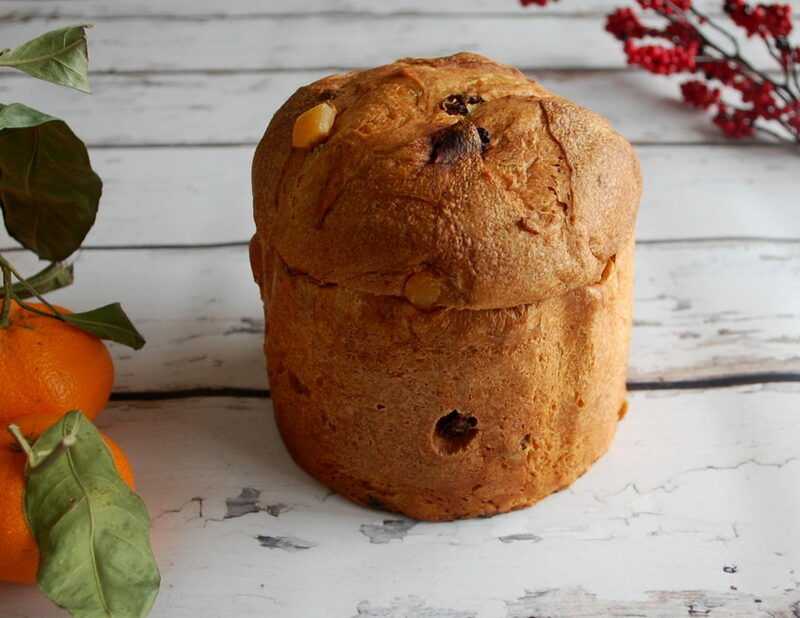 Panettone is a traditional sweet Italian holiday bread. It’s specked with dried fruits such as currants or raisins, and has a citrusy kick. While you can make your own, such as Mario Batali’s recipe, the store-bought version is delicious too and much, much easier. Each loaf comes in a decorative little box, and as soon as you open it, you immediately are hit with the most luxurious smell. Even though it’s quite delicious simply sliced up and served with soft butter slathered on top, it’s even better dipped into a rich custard and cooked until golden brown. The trick with panettone is to not soak it too long in the custard. While some breads are sturdy and able to sit in liquid a long time without falling apart, panettone is definitely not. It’s very delicate, so a quick dip is all it needs. 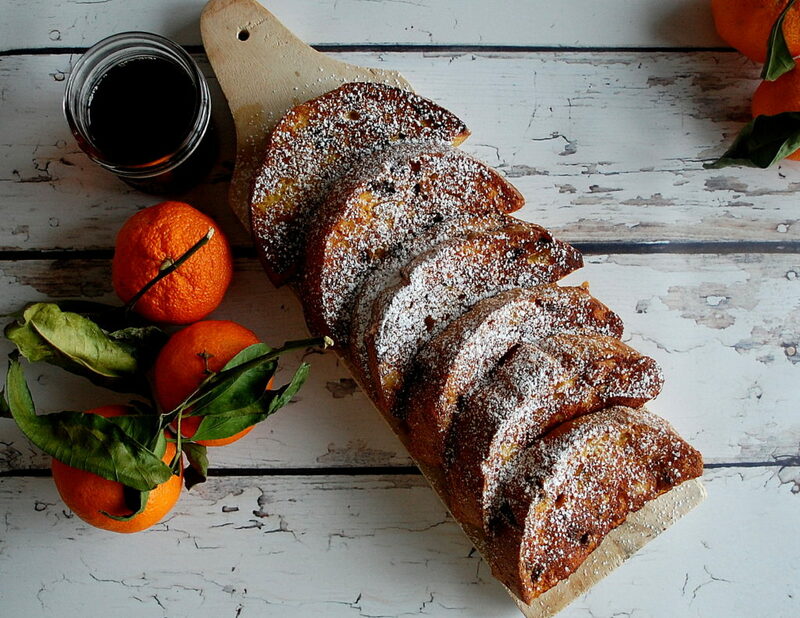 The most common citrus you’ll find in the bread is orange, usually the zest or even candied peel. So I make a simple orange whipped cream to serve on top to bring out even more bright flavor. 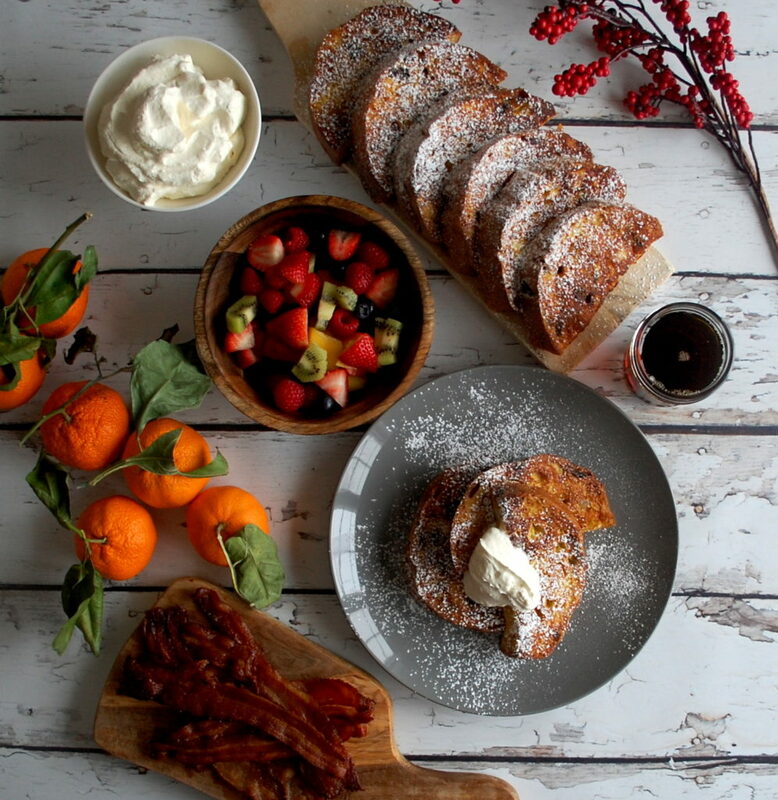 A decadent drizzle of maple syrup brings everything together into one of the absolute tastiest holiday breakfasts. Enjoy! Using an electric mixer, whisk the cream until it reaches soft peaks. Add the orange zest, vanilla extract, and sugar. Continue to whisk until stiff peaks. Be very careful not to over-mix. Refrigerate until ready to serve. Preheat the oven to 350°F. 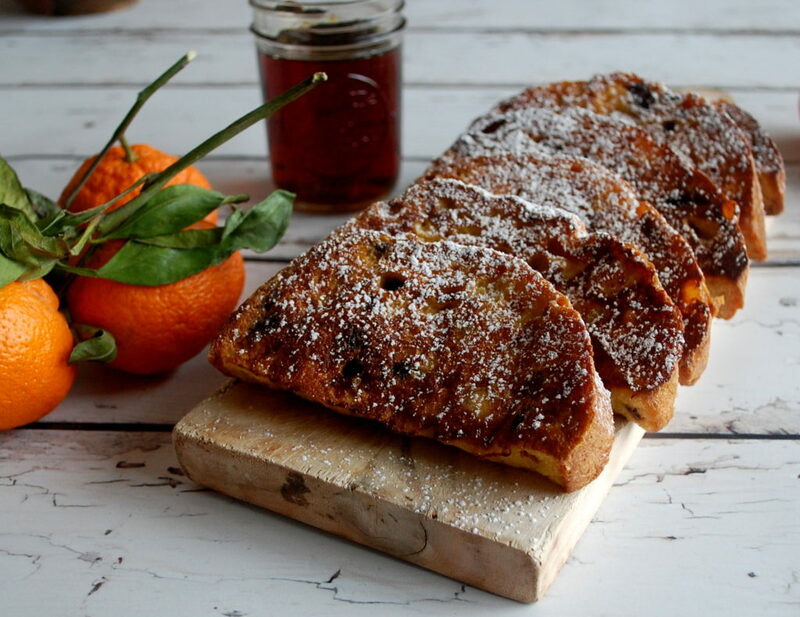 Slice the panettone in half, and from there into ½ inch slices. In a mixing bowl, beat the eggs. Whisk in the milk, vanilla extract, almond extract, and honey. Preheat a flattop griddle over medium heat (you can also use a sauté pan). Meanwhile, dip each piece of bread into the custard mixture. Line the bread onto a rack. Once the griddle is hot, add enough butter to coat your surface completely (my flattop takes about 2-3 tablespoons). Place each piece of bread onto the griddle. Cook each side until golden brown (about 3-4 minutes per side). Work in batches if all of the bread won’t fit on your surface, adding more butter for each batch. Line the bread onto a baking sheet and bake for a few minutes until done. 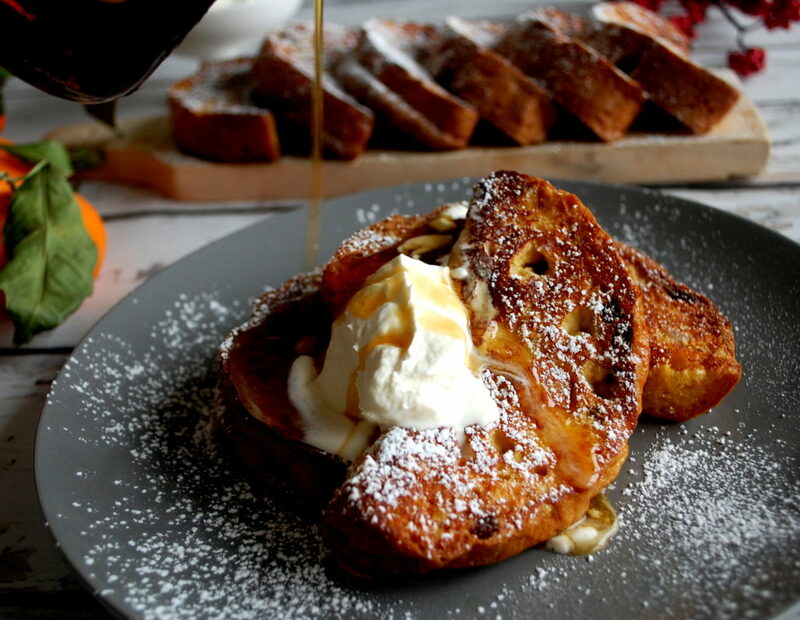 Serve the panettone French toast with a dollop of orange cream and a generous drizzle of maple syrup.